Coming up we’ll hear from David Morgan of The Morgan Report. David gives his insights on current industry sentiment following a few rough months for the metals, tells us what to expect with the upcoming price action for gold and silver, and gives us his predictions on how the financial markets will react to Donald Trump’s presidency – and his outlook may surprise you. 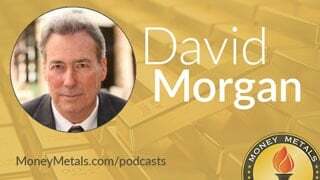 Don’t miss another fantastic interview with the Silver Guru, David Morgan, coming up after this week’s market update. Precious metals markets continue to show signs of basing out and recovering into a potential rally, with the white metals leading the way. The silver market registers a positive gain for the second straight week, albeit a small one. Spot silver is up 0.7% since last Friday’s close to trade at $16.97 an ounce. Platinum prices come in at $922 per ounce, and due to a 2% drop here today is now down 1.3% for the week. Palladium, which had been white hot in November, cooled off a bit this week, falling 0.4% to $744. Gold, meanwhile, has been probing lower levels for the past few weeks. The yellow metal currently comes in at $1,163 an ounce, down 1.4% on the week. Gold continues to be overshadowed by the resurgent stock market. The Dow Jones Industrials rose to another record this week. The blue chip average could soon hit 20,000 on strong post-election momentum. The Dow to gold ratio is also on the verge of setting a new multi-year high. The Dow currently equals 16.7 times the price of gold. The ratio comes in higher than where it was at the start of the year. But it’s still a long way away from the 45 to 1 ratio seen at the peak in 1999. It’s also miles away from the 1:1 ratio seen at the 1980 low. Gold and silver have been hurt in recent weeks by a strengthening U.S. dollar index. Currency traders are pricing in a rate hike at next week’s Federal Reserve meeting. The European Central Bank met this Thursday and left interest rates unchanged. That was expected. But the ECB surprised markets by announcing that it would trim its quantitative easing program starting next April. It’s not really a tapering, though. The ECB extended its bond buying program through the end of 2017 and expanded the range of securities it would buy. In response, currency markets whipsawed, with traders ultimately deciding to dump euros and bid up the U.S. dollar. Unless the Fed comes out with policies or language to arrest the rise in the dollar, it could continue to gain versus the euro in the months ahead. That doesn’t necessarily mean gold can’t gain in dollar terms. But it will need a catalyst to overcome headwinds in the currency markets as well as the price suppression schemes of institutional sellers in the futures markets. Yes, believe it or not, the gold market is subject to being manipulated from time to time. Sometimes by some of the world’s biggest banks. Last Friday, we found out that Deutsche Bank will pay $60 million to settle claims of gold price rigging. Documents released as part of the lawsuit reveal that the rigging runs deeper and extends beyond the gold market. According to a Bloomberg report that came out on Wednesday, traders with multiple large international banks, including UBS, allegedly conspired to rig the silver market. Bloomberg Anchor: Today we're talking about gold and silver market rigging. I'm just curious, has there been an uptick? Even though some of this is a couple years old, has there been an uptick? Is it just that it's newly discovered? I mean, what's going on here? It seems like there's an awful lot of rigging going on in various different kinds of markets. Market Analyst: Right. As you mentioned, a lot of this stuff is from several years ago, but it does raise the questions of whether it wasn't just LIBOR. You had the LIBOR rigging scandals, and then you had currency markets, now you have allegations in the silver market. The new smoking gun evidence shows that some of the biggest market makers in the silver exchanges haven’t been playing fair. They have been colluding to control spreads, slam down silver prices in coordinated midnight raids, and cheat their own customers. Chat logs between Deutsche Bank and HSBC traders that have now been made public reveal one particular exchange where one trader says he really wants to sell silver. To which the other responds, "Let's go and smash it together." The Commodity Futures Trading Commission supposedly spent five years investigating allegations of silver market manipulation. In 2013, CFTC officials basically said they couldn’t find any wrongdoing. Maybe they just didn’t WANT to find any wrongdoing. In any event, the paper markets for gold and silver are neither free nor fair. Individual investors should avoid trying to swim with the sharks – which means avoiding futures, options, and other derivative products that are controlled by big institutional traders. Stick with physical bullion products and know that in the end, the real supply and demand fundamentals in the physical markets will ultimately override the artificial games that are being played in the paper markets. Well now, for more on the future of gold and silver and one insider’s take on the likelihood of some serious financial turmoil breaking out during Trump’s first term, let’s get right to this week’s exclusive interview. Mike Gleason: It is my privilege now to welcome back our good friend David Morgan of The Morgan Report and co-author of both The Silver Manifesto and now Second Chance: How to Make and Keep Big Money During the Coming Gold and Silver Shockwave. David, it's always great to have you on, and how are you? David Morgan: Mike thank you and honestly I'm not a hundred percent, I got a little bit of a cold still hanging on but I'm just about over it and had a little dental work, but I'm doing good. Thank you. Mike Gleason: Well I'm sure with all of your travels here it's probably easy to pick something up and that's kind of where I wanted to start first. I'd like to have you tell us about some of those recent travels because I know you've been quite the jet setter here of late. Just in the past month alone I know you've been to the Silver Summit in San Francisco and then last week you were telling me you were in Sweden, so you've been traveling around to various conferences and meetings in the precious metals community and I'm sure you've gathered some valuable information as a result that you may want to share with our audience here today. So what have you learned, and what is the sentiment out there right now? Because there are few that have their finger on the pulse of the industry better than you, so what can you tell us there David, and then give us some highlights of these conferences as we start out. David Morgan: Well thank you for that. First of all I think if we go back to roughly the last four or five weeks or so, I made a trip to the Edelmetall Show, which is the Precious Metals and Commodities Show in Munich. This is a show that I've done many, many times, and one of the people that is one of the principles of that show actually translates and has translated The Morgan Report into German for years and years and years. And Jan asked me if Bill Holter would be amenable to coming over and speaking as well, and I said, "Yes, I'm sure he would," and they invited Bill Holter along with myself and many others of course. Most of them are Europeans but they're from all over the world. And the sentiment in Germany is still very positive to metals. They are big bullion buyers. They are very much believers in what I've taught from the beginning, which is you have to own the real metal first before you go in the mining companies. They're also large shareholders into mining companies across the board, meaning speculative juniors to mid-tier producers to top grade cash rich unhedged mining companies which we kind of stress in our reports. What's interesting is the amount of the sentiment. The sentiment in my main part of the industry is the U.S. and Canada, and our subscriber base dropped off probably 60% or more from the top of the silver market in April 2011 up until the end of last year. It's built back somewhat, but Germany it never faltered. I mean it's hard to believe that Mike, but basically the subscriber base in Germany held through basically thick and thin. So the main takeaway is that they understand the metals. It's in their consciousness because of what their parents or grandparents went through with the Weimer Republic. They believe in the real metal first, but the main concern wasn't really economic as much as it was fear of an outbreak of war. Now this was pre the election. I left I think the day before the election, so it was November 7th when I left Germany. A great deal of concern revolved around the fact that these missiles have been placed upon the German border, which is NATO obviously, facing in toward Russia. Of course the Germans, probably more than many, the population at least is very upset about any war activities. I mean they've been through enough, you know World War I, World War II, you know all that's gone on. The Cold War, the Berlin Wall and on and on, and these people really just want to live their lives and be left alone, but they're part of NATO and they see this. So I think that's calmed down somewhat. I don't follow that type of news as adamantly as I probably could, but it's not ... I have to spend my time where I'm required to do so and my main interest of course is currency crisis. The upcoming reset and everything that deals with the precious metals and beyond. So that would be Germany. As far as the Silver Summit in San Francisco, it's been renamed the last few years. It's now the Silver and Gold Summit. They still feature silver first which we're very grateful for. I'm glad that they never dropped the conference. Well attended. Great speakers. Sentiment was good but not great. By that time silver and gold had already sold off fairly sharply. A lot of people were asking if the rally was over, if it was just a fake rally within the context of an overall bear market. Where do we go from here and that type of thing. I would say we all had our own opinions but most of us were (saying) that this is a correction within the new phase of the bull market. Better times are ahead. This is the time to look for value and buy value. I'd like to point out on the mining side is that how many of your listeners missed the move of silver to $50? And I say that with my tongue in my cheek and I really want to explain it. Because a lot of these companies that we feature in The Morgan Report and others have done the equivalent of silver going from these lows in the $14 range all the way to $50 as far as the percentage return is concerned. That's something that you get when you invest in a mining company or a natural resource stock, is leverage to the upside and the downside. I'll be honest about that though, I saw this thing topping and I warned our members that they should really take some profits of partial profits or hedge. Take something off the table. I was early which is always good. You want to sell in the strength. You want it to be topping. You don't need to get the exact last tick. I took a little flack from some of the Twitter folks, but that's fine. And lo and behold you know that hundred dollar moved down in gold, a lot of my folks booked some profits. Having said that, even some of these stocks in the top tier. I mean if you bought in 2012 one of our main feature stock in the top tier, I mean that stock was a $38 stock and today it's at $75. So what I like to point out is that some of these companies can do moderately well to very well even in a down trending market if you pick the right kind of companies. And of course we don't get them all right, but believe me, we get most of them right and that's the reason when I started The Morgan Report I emphasized the top tier cash rich unhedged mining companies and then the mid-tiers. Speculations are just that, and I love to speculate. I think everybody does, but it's an art not a science and that's where you have to be careful. Mike Gleason: David, in your most recent newsletter you addressed some of the market action following the election. We've seen commodity prices move higher, driven in part by Donald Trump's plan to spend a trillion dollars on infrastructure, but you advised some caution. The action in the bond market should give investors some reason to pause. People are selling bonds. They anticipate the Fed will be hiking the funds rate here next week and they recognize Trump's proposal to cut taxes and increase spending on infrastructure will likely mean a massive new wave of government borrowing. These rising borrowing costs are going to provide some headwinds to economic growth given our addiction to debt, so the question is, how strong will those headwinds be and what do you expect for the bond market and interest rates over the next year or so? David Morgan: I think the pressure's on for interest rates to rise. The Fed is not all powerful like most believe. I'm almost certain we'll see a raise in this month. And that's because the fed almost has to because the market's already spoken. The market's already raised interest rates on a 10-year note rather significantly on a percentage basis, and there will be more pressure. Because everybody knows that lower taxes and increased spending means a wider deficit not a narrower deficit. It's baked into the cake Mike. I think this is very bullish for the metals. I think there will be a sentiment change in the country for the most part. I think the sentiment will be “better times are here, more jobs are available… you know we're doing something worthwhile” and that type of thing, but the real structural problems that are pervasive throughout the global economic system led by the Federal Reserve and let's say the European banking systems are so pervasive. They're so interconnected nation state to nation state. Of course the BRICS have tried their best and maybe have moved off somewhat where they might be able to side step some type of the financial calamity but not all of it. As we progress forward bear in mind that nothing structurally has really been fixed. It's kind of like having a foundation that's rotting and then starting to put some new fascia on there. It starts to look good and the neighbors are happy. It's looking better but unless you fix the foundational problems you're not going to really make a solution. Mike Gleason: I don't know about you David but I've been rather encouraged the way silver has hung in there over the last week or so since we saw that last leg down right before Thanksgiving. We've been seeing gold drift lower but silver is actually outperformed something we generally don't see when gold is falling. What do you make of that? Is that a function of silver being aided by its status as an industrial metal during a time that many believe industrials may do well in? And is that maybe a good sign of a short term bottom in the metals? What your thoughts there? David Morgan: Well my thoughts Mike are slightly different to the what the mainstream banking system would tell you, that with the infrastructure build out it's going to be more industrial use for silver and therefore it's strong. My take is being in this market for several decades, is that silver leads gold when we're in a bull phase. And I still think we are in a bull phase. I think we've had a pretty nasty correction and I think it's going to continue for a short time longer. But when silver starts to pull away from gold or is neutral and gold continues down, in other words the gold/silver ratio starts to decline, that to me is just another sign that we are in a bull market, so this is fully expected by me. Another thing that is fully expected is the strength of the U.S. dollar. This is something that a lot of people have a hard time wrapping their heads around but in an uncertain market people seek safety and they seek what's certain. For most people that means cash. Mike Gleason: That leads me right into my next question here. The metals market really do seem to need a catalyst for higher prices and right now we're fighting a stronger dollar as you mentioned, and rising interest rates in an environment where many investors seem to be in a risk on mood. Safe haven investments including metals are less in vogue right now. But of course the reasons to own the metals haven't simply vanished as we just spoke about, so how long are you expecting the risk on mood to last and do you see any specific event or events that are likely to derail the strength in the dollar or put a bid back under safe haven assets? David Morgan: Great question. Whenever you get these types of questions it's best not to answer them. I don't know would be the best. I mean the market knows more than anyone and I look for queues or signs from the market and then based on that do a pretty decent job. Better than most actually on short to intermediate term calls. I think that we're going to see a neutral market probably up until Donald Trump actually is sworn into office. There's a lot of news sites out there, and I'm not talking fake news, real news that are concerned about what's going on with this vote recount and all that's going on. I've been paying attention to it but not a whole lot. I think Trump will be sworn in. I think once it settles in, you know, a new president is there and the programs that he's enacted, the cabinet he's surrounding himself with, all of that, will play into the gold market. Because as we already discussed, we're going to see lower taxes and more spending and that's inflationary. And that will not only be a mode for people in the United States, it will be global. Because a lot of other Europeans and Asians will be concerned with the bond market, the debt markets getting worse not better which means rising interest rates. Most people think rising interest rates are negative for gold, but actually gold did great during rising interest rates until the rate got well above the nominal inflation rate, so let me explain that briefly. In 1980 the true inflation rate by government stats was about 13%. So as interest rates started coming up during the last final phase, the last weeks of the silver and gold bull market, interest rates were rising rather rapidly and gold continued to rise just as rapidly until (Fed Chair Paul) Volker went ballistic and set interest rates at like 18% ... 18 to 20 actually. That was like 5% above the inflation rate, so when you have a real rate of return of like 5%, 4%, in that range, then that usually quells the metals. There's nothing to fear about rising interest rates or a falling bond market. In fact the bond market is of course the big problem and you know we've talked about that numerous times, and if you really want to delve into it there's lots of information you can Google on the internet. If you want our take, it took a lot of time and effort, you can read the Debt Bomb in The Silver Manifesto. Mike Gleason: Yeah, that's well put. It's definitely all about the real interest rate environment, not the nominal interest rate environment and it's sort of laziness to think that higher interest rates automatically mean lower precious metals prices. It's all about where they are on that curve with the inflation rate. Now one thing that's a bit interesting here are the rumors emerging out of India that may result in a ban on gold imports again. As many know, Indian citizens are pretty much the biggest gold buyers on the planet. It certainly wouldn't surprise us as the government has already cancelled two of the most common rupee bank notes suddenly, causing a bit of chaos. Now the last time they banned gold in India it mainly just raised its domestic price as smuggling emerged, but silver demand benefited in particular. Any thoughts on this unfolding situation David? David Morgan: Well going back to the beginning of our conversation, you now, when I was in Germany, Mark O’Bryne of GoldCore was at that conference as well and I've had many Skype calls with Mark and I've known him for years and I like what he does. I like what he writes. He was at the conference so I got to meet him. And we did get to hang out together. He just wrote an article I think yesterday, talking about is silver the new gold for India. Which means that the government's putting all of these screws down on a population for owning gold, or proving they owned it or if they inherited it or how they bought it or all this stuff. And this is in the rumor mill. I haven't had time to determine what's fact from fiction, but that's what swirling around the internet right now. And his article went on to say well that's fine. The Indians will just move back to silver. What a lot of people don't know really is India's always had a propensity for precious metals, but it was primarily silver for decade after decade after decade because silver was much more affordable to the population than gold. Not that they weren't big gold buyers, but it wasn't as pervasive as silver. Now that so much work has been off-shored to India for software in particular, and other things, the population as a whole has gotten even wealthier, and because they've gotten wealthier they've moved more into gold and other investments… I mean there's a middle class developing in India and they're becoming more Westernized and their thinking is becoming more Westernized and rather than just because dad and mom and grandma and grandpa always bought precious metals I'm thinking about mutual fund or whatever. That's all part of the scene but going back to what Mark's article said, it's like, okay if the government is really putting the clamps down on gold ownership you'll see a push into silver in India and silver's move in India has been rather robust the last couple of years. It got not only a large investment demand that's carried through but also their solar industry, government sponsored, is rather robust. Mike Gleason: As we start to wrap up here David give us your thoughts on the remainder of the year when it comes to what you're expecting in terms of the price action in the metals because I recall in years past you were predicting a price raid in the metals over the last week or so of December which is exactly what we've gotten several times now over the last few years. Are you looking for something similar there this year? And then also talk about what you're working on in the Morgan Reports and if there's anything new there that you want to cover before we close. David Morgan: Yeah Mike I do think we're going to see probably a push down into the last few trading days of the year. It's been pretty easy to forecast. It doesn't necessarily mean it will happen this year, but any market that's small is easy to move. Any market that has a very tight float and very low volume, if somebody comes in and buys a whole lot it's going to shoot the price really high or conversely a small float, no volume, and someone comes in and sells a ton, it's going to drive the price down. That's what will take place, I think, going into the end of the year. Does it mean we shouldn't load on some good silver and gold for Christmas gifts or all that? I think it's an amateurs game to try to pick the exact bottom. I think we're pretty close right now anyway. Could it go lower? Yes. Do I expect it to go lower? Yes. Substantially lower? No. As far as what we're working on Mike, it's one of the most interesting things I've seen in a long time. I made what I call an emergency trip to Vancouver B.C. to witness two things. One is… and I'll call it a modernized ball mill, and I met with the engineer and being an engineer at one time we got along famously and had a nice chit chat about his design and how truly beneficial it will be as a mill. Then there is another aspect to this company, and this is a company that's in the speculative section of The Morgan Report. This process that I witnessed with a solvent, I guess you could call it a solvent, because water is the best solvent on the planet and we drink it. It's similar from the aspect that it's non toxic. You could actually drink it, it wouldn't harm the body. And yet it precipitates out almost any metal. So I went into the lab and witnessed this, filmed it myself and I'll be putting this out as soon as I'm able. There are certain rules that I have to adhere to and I do, which means I can hand tout it like I'm doing with you Mike, but I can't really say too much without it being publicly disclosed. I do think it's going to be publicly disclosed within a week or two. This is something that anyone that's a website member of The Morgan Report, the page site, of the website. They will probably, if they own most of the spec stocks, they'll already have an in on this company because what I've been told right now is there will probably be a spin out of a holding that we've already put into our subscriber's hands. This happened to us once before but it wasn't a new technology. It wasn't as exciting as what I just described but as far as the mechanics of what I just described... we had a coal company and they had a platinum project and people that owned that company were spun off a share in this new platinum company. So basically you got kind of a two for one. That company's gone on to get one of the best silver deposits on the planet and it's very undervalued. I'll be doing an interview with the CEO, probably in the next week for our website members. That's the last thing I want to mention Mike, and it hit my brain. As I said I'm still getting over this cold. One thing that we do that no one else in the industry does to my knowledge, is when we go to the Gold and Silver Summit, we interview almost every company there. I do the interviews, or my staff, one of the three of us, interviewed almost every silver and gold company that was attending the conference. We have about four speculative companies that are like high risk, high reward, but they've got interesting stories. We provide all that in a video format for the website members so they can log in and watch these things at their leisure. Take notes, pause it, write down things. Let's say you call up the IR department at one of these companies (and say) "I'm a Morgan Report subscriber and I heard so and so talk about such an such and I'm interested in getting with the IR department and learn more information," and that type of thing. You know it's a service that those that are aware of it and subscribe are very, very happy with it. But I do want to get the message out that we just finished compiling all of the videos that shot at the Silver Summit and they will be going up on the website for our website members probably today. Mike Gleason: Yeah that's great stuff. Very fascinating information there on that new technology. I'm sure people are going to want to check that out. There's another great reason to get The Morgan Report and then obviously what you're talking about there with the Silver Summit interviews. That will be great stuff as well I'm sure. David, we always appreciate your thoughtful analysis here on the Money Metals Podcast and I'm sure we'll be talking again real soon. Now before we let you go, just please tell people how they can get information about The Morgan Report and how they get involved with that. Then also mention the new book you and David Smith just came out titled, Second Chance: How to Make and Keep Big Money During the Coming Gold and Silver Shockwave. Tell us more about that as well. David Morgan: Certainly. The best way to get on our free email list, free list, is just go to TheMorganReport.com. There's a little video there. You can click it twice and I’ll stop talking, and just give me a first name and a primary email address. It's a double opt in which means that we will mail your email address that you gave us and say you are really who you say you are. Once you do that you will be on the list. You will get a weekly update from me or one of my staff on a general outlook of the metals markets. There is some advertising on that. I mean I have to pay for those lists and the servers and everything else, so I'll let you know that right up front. We send it out usually twice a week or something along those lines. The weekend one is the one that is the free analysis or question of the week or we do have some videos of kind of hitting the high spots in the currency markets and the precious metals every week. So that's the way to get familiar with our work. As far as the Second Chance book is concerned, this is something that I wish I had the first time that silver went from $5 to $50. I might have been a little better at taking profits, although I did fairly well in gold. I mean I actually got in my biggest position at $300 gold and got out about $700, so I did pretty well and it was leveraged position, so I was pretty happy about that. A lot of people don't understand that everything is undervalued, fair valued and overvalued. These metals will get over valued. Right now they are very undervalued. They are not even fair valued. But once they get to an overvalued situation you don't want to be married to these things. You need to take some profits and where do you take profits. Well we'll try to help you if you're a subscriber to The Morgan Report. You know I'm a pretty giving guy. If I do an interview like this I'll probably make some suggestions for the public domain as well. I don't have any problem with that, but the idea is when these metals get to a point where they are so over valued and everybody wants in, you should be looking to get out or at least get out of part of your position if not maybe the entire thing, at least some of it. Those days are ahead of us Mike. I don't think they're too far off. I actually, and I don't like giving dates. I’ve certainly have had my share of hits and misses, but I really doubt that this four year term of Trump will go without some kind of financial conundrum, where we are in a 2008 type of situation. It won't be exactly the same but it'll be similar. It may even be worse. I just don't see us going four more years with the debt situation that we have, with the tensions surrounding Europe, with the euro and people wanting to exit the euro. What's going on in their political mainstream between Italy recently and of course Brexit. The general shift of the idea that the bankers are the problem. You know this is something that I knew many, many years ago but very few would even agree with me, and it would be considered fake news and extremist. I've been studying this for years and the main problem is how money works… as Michael Rupert has so famously said, "Unless we change the way money works we haven't changed anything." You can change the politics. You can change the politicians. You can change the ideology or the sentiment, but unless we change the way money works we really haven't changed much. And unfortunately we haven't yet. However, I do think, as I said, within this next four years there will be some type of reset and some type of monetary change and hopefully it's for the better. Mike Gleason: Well very well put David. We'll leave it there. Thanks so much and we really appreciate your time as always. I hope you have a great weekend, a Merry Christmas, and all the best with the new book, and we'll look forward to catching up with you again after the New Year. David Morgan: Thank you Mike. Appreciate it. Mike Gleason: Well that will do it for this week. Thanks again to David Morgan, publisher of The Morgan Report. To follow David, just visit TheMorganReport.com. We urge everyone to at the very least to go ahead and sign up for the free email list and start getting some of his great commentary on a regular basis and if you haven't already, be sure to check out The Silver Manifesto, and now his new book as well titled, Second Chace: How to Make and Keep Big Money During the Coming Gold and Silver Shock Wave... both of which are available at MoneyMetals.com and other places where books are sold. Either one would make a fantastic gift this holiday season for anyone investing in or thinking about investing in precious metals. And don't forget to check back here next Friday for our next Weekly Market Podcast. Until then, this has been Mike Gleason with Money Metals Exchange. Thanks for listening and have a great weekend everybody.